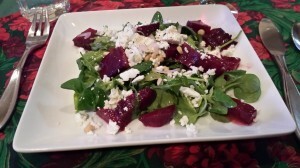 Roasted Beet Salad with Goat Cheese and Pine Nuts. You either like beets or you don’t. 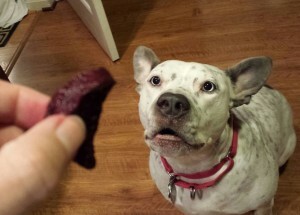 Some people think that beets taste like dirt. I don’t. I’m a huge beet lover. My maternal grandmother used to make pickled eggs and beets and always had a jarful in the refrigerator. (I loved those sweet purple hard-boiled eggs!) 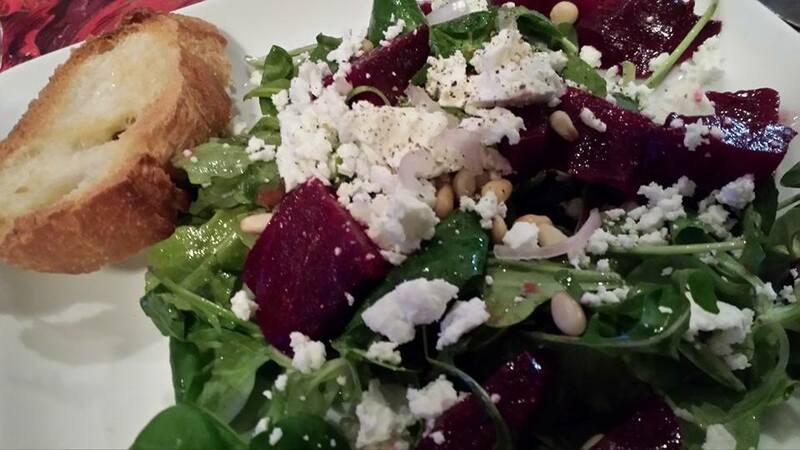 My favorite way to enjoy beets is in a salad. My Roasted Beet Salad with Goat Cheese and Pine Nuts with Strawberry Basil Balsamic Dressing is simple to make. Roasting the beets is easy, and even you can do it! You can always purchase roasted beets from your local grocer, or even use canned beets. But I find that roasting your own beets is far tastier than store-bought versions. You can control the texture of the beets if you roast them yourself — many times I’ve purchased store-made roasted beets that were hard as a rock! You want your beets to be tender, not too firm or mushy, and easily cut with a fork. Target’s Archer Farms brand makes some good quality and unique products. I really like their flavored vinegars and use Archer Farms’ strawberry basil balsamic vinegar in the dressing for this salad. My dressing is dijon mustard-based and goes well with beets. 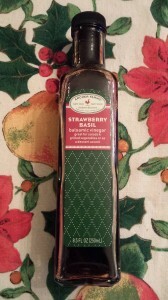 You can use regular balsamic dressing if you can’t find the Archer Farms strawberry basil balsamic vinegar. I like to use arugula and mache as the greens in this salad. The mache has a soft texture and the arugula is peppery. You can use whatever greens you like. Fresh spinach works well in this salad. We recently adopted a dog that we named Atticus. Atticus goes by Addy as a nickname. Addy loves vegetables and has a special craving for carrots and beets. 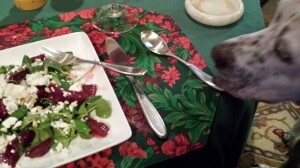 This roasted beet salad certainly got his attention! I hope you like the salad, too. Whisk all ingredients together in a non-metallic bowl. 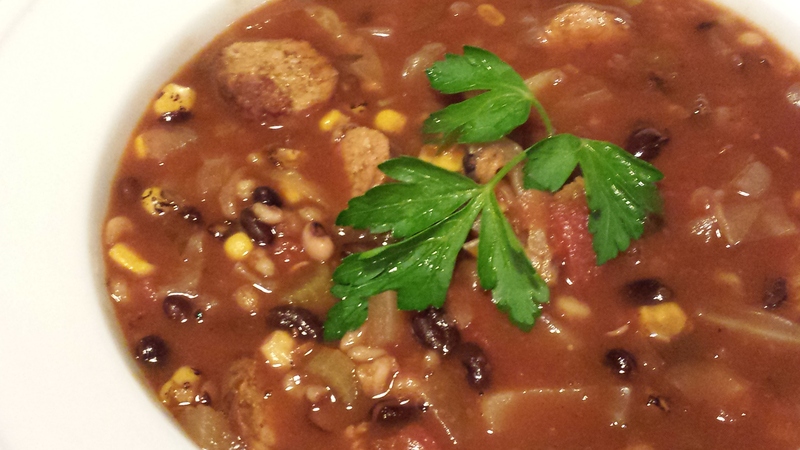 Store up to a week in the refrigerator. 1. 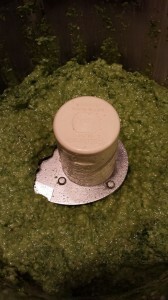 Combine mache and arugula in a large non-metallic bowl. 2. Toss the greens with 3/4 of the strawberry basil balsamic dressing. 3. Divide the greens amongst four salad plates. 4. Toss the beets in the bowl with the remaining dressing, and divide amongst the salads. 5. Divide the goat cheese crumbles amongst the salads. 6. Divide the sliced shallots amongst the salads. 7. Sprinkle each salad with some pine nuts. Makes 4 salads for a salad course. Makes 2 salads for a main course. Variations: Substitute pecans for the pine nuts. Use bleu cheese crumbles or even shredded cheddar cheese instead of the goat cheese. Use beets that are not red, such as yellow or rainbow colored beets to add some different color to your salad. Try other greens such as butter lettuce, fresh spinach or even chopped kale. Add some garbanzo beans or cannellini beans for a little extra protein. To roast your own beets, preheat your oven to 400 degrees. Remove tops, wash, and peel 4 large beets. Cut the beets into 1 to 1.5 inch chunks. Place the beets in a parchment-paper-lined baking pan and toss with some olive oil and sprinkle with salt and pepper. Roast the beets for 30 – 45 minutes depending on your oven’s temperature and your beet firmness preference. Beets should be tender and easily pricked with a fork when done. Turn beets once or twice during roasting. Cool beets before making the salad. 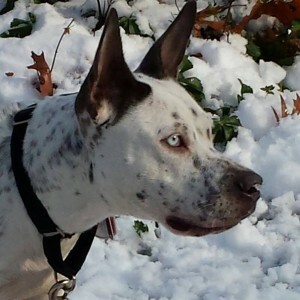 You can follow Atticus (Addy) on his Facebook page. He’s definitely a character!